Our apartment is suitable for families and friends. 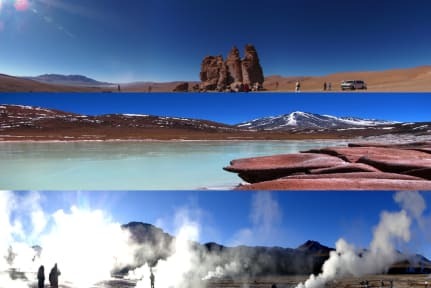 It is located in a quiet and confortable place where you will be able to enjoy your stay and discovering the very best of San Pedro de Atacama and Chile. In addition, the apartment is filly equipped to offer to bring the guests and travellers an excellent service and amenities. We are located in one of the best locations of the city, right near to some of the finest attractions and most renowned landmarks of our city such as Meteorite Museum, San Pedro de Atacama Church, Mirador Pukara Quitor and Death Valley, amongst other important spots of our city. The cabin rooms are very cosy and they have double beds, pillows, towels as well as furniture which you can use to put everything away. The cabin has a bathroom, a living room a basic kitchen, a parking space and hot water. All what you need to have a pleasant and fantastic stay in our facilities. Breakfast not included - 5.000 CLP per person per day.